General Fasteners Company is proud to be a pioneer in Vendor Managed Inventory (VMI) Programs. From our humble beginnings in the late 1980’s, when we supported our customers with simple, in-plant stores manned by GFC attendants, our programs have developed into some of the most robust, technically advanced systems in the industry. By combining the basic principles of pull-system inventory management and KANBAN signals with modern-day bar-coding technology and electronic exception report monitoring, we eliminate the guesswork and inherent inaccuracies of our competitor’s single-bin/keep-fill system. Not all Inventory Management programs are created equal! VMI programs are a cornerstone of our business model. We help our customers realize true cost savings by leaning out their manufacturing plant floors, reducing non value-added activities, consolidating vendors and part numbers, freeing up working capital, and helping to achieve strategic initiatives by becoming a true working partner. GFC has a professional team of Program Managers that are responsible for designing and managing inventory flow for our customers. With support from our strategically located distribution centers, we can provide optimized delivery schedules utilizing either returnable or expendable packaging. Our Program Managers also conduct on-going reviews to analyze changes in usage and to make appropriate adjustments to the Plan for Every Part. Our programs are designed to minimize in-plant inventory without compromising production. Our Kanban programs are based on the principles of a pull-system, which triggers a replenishment cycle only after a defined number of products have been consumed. By properly setting the replenishment quantity (bin quantity), and by practicing discipline in our work, we are able to eliminate the human element associated with single-bin, keep fill systems that rely only on guesswork and assumptions. If you are currently overstocked on some parts and running out of others, request a consultation today so we can help you achieve the inventory turns you deserve. BinTrac Advantage with Smart Label technology allows our Program Managers to monitor each bin throughout the replenishment cycle and easily: edit point of use and/or replenishment quantity changes, add or remove bins to the replenishment cycle to meet temporary (weekend or holiday runs), or long range shifts in production. Our Smart Label technology updates each time a bin is replenished with the latest BinTrac changes, including fill date and manufacturing lot number. Through the use of our Smart Label technology, we are able to monitor, and even order, other supplier’s product on your production floor, eliminating the need for you to manage this inventory. We can also establish a 3PL program that integrates with our multi-bin KANBAN programs, saving you the trouble of ordering products and the costs associated with having too much or too little inventory on hand. For those customers that want an on-site presence, or that have drastically fluctuating demand, GFC offers In-Plant Store with consignment inventory. GFC employees become an extension of your workforce to ensure a consistent, reliable supply of your production materials through these stores. In addition to Fasteners and C-Class Components, our on-site stores are capable of handling a wide array of additional items, such as: electrical terminals and ends, wire, wire routing and management hardware, chemicals, kits, assemblies, handles, hinges, switches, conduit, hoses, insulating components, stampings, decals….you name it. If it can be inventoried, we can manage it! Having the right parts at the right time is critically important when building highly-configurable products. GFC understands this need and will kit components and deliver them lineside based on sequencing schedules. Kits can also be customized to include hardware, C-class components, and even customer provided or source-directed products that show up on your job-site or at your end customer for final assembly. 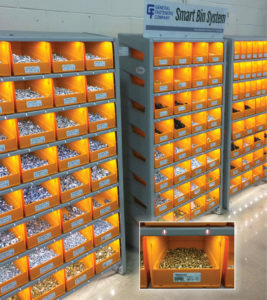 General Fasteners Company is proud to offer our Smart Bin inventory management systems powered by Apex Connect n’ Go Technology™. This cloud-based, continually monitored, “program of the future”, is available today to meet your most dramatic fluctuations in demand. By electronically monitoring your usage, our Smart Bin systems automatically generate replenishment orders 24/7/365. They provide the ultimate in the Right Parts, in the Right Quantity, at the Right Time! Request a consultation today to see if a Smart Bin System by General Fasteners is right for you.